The leading international trade fair for metalworking opens its doors. 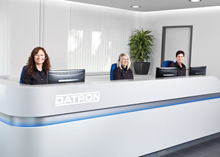 On a total of around 120 square meters, trade visitors can look forward to the latest DATRON technologies and innovative production solutions in the field of high-speed milling. This year DATRON AG presents itself on two separate exhibition stands. In hall 10, booth 10 D74, visitors to the fair can expect a special trade fair highlight in addition to the proven DATRON high-speed milling machines MLCube, M8Cube and the DATRON neo. The brand new DATRON MXCube for demanding industrial applications. The highly dynamic 3-axis gantry milling machine convinces all along the line and meets all requirements for economical high-speed machining, especially of aluminum. In combination with the pioneering DATRON next controller, DATRON milling machines offer the perfect combination for maximum performance, precision and dynamics in everyday production. Already at the market launch last year, the evolutionary software was convincing across the board. At the AMB in Stuttgart, it now fascinates with new, impressive features and functions. Anyone familiar with DATRON knows that the milling machine specialist not only offers forward-looking mechanical engineering, but also operates its own milling tool division at the highest quality level. On the separate tool stand in hall 3, stand 3D80, the tool experts will advise AMB visitors about the extensive tool assortment and this year's DATRON test tool action, which includes a free one-touch mill of choice. Convince yourself and visit DATRON AG at the AMB 2018 in Stuttgart.